…room number 30. “What a beautiful door…the others are so plain,” said one. “It’s meant to influence our decision,” said another. “Perhaps this has been done so we will not choose this door,” said the thoughtful one. They wanted to know what the letters meant. Obviously they meant something, and I said so. The more confused they became, the more I enjoyed it. No matter how many times I’ve been through this I’m always fascinated. ● Anagrams point to all three incorrect doors. The sign IF NO EVE can be rearranged to say ONE FIVE (one&five=15) but it is pointing at room 5. [Credit: Beth Kinder] “ONE FIVE” can also mean “there is one five” meaning “5″ and thus points to both 15 and 5. [Credit: David G | White Raven] The watch with a hour hand pointing to the “F” which is leaning against a fake tree can be read as “tree” and “F-hour.” (We know it is the hour hand because the longer minute hand is on the floor next to the watch.) Moving the “H” from “hour” to the word “tree” the words read as “three” and “four” – door 34 is another of the incorrect doors. [Credit: Owen Hammer] Perhaps, reinforcing this, the last letter of the ABCDEFGH sequence (the H) is the letter which must be moved to make the anagram work. The No Eve means Adam or Add them as said earlier. The clock points to “F” which is 6 in alpha numeric. The “O” is 15 and the “U” is 21. 6+15+21=42. Baddah Bing, baddah boom! Add ‘em up and go thru 42! Sorry it was already mentioned, you may now post freely. I think that’s probably it. It’s the same anagram structure as the obvious “ONE FIVE,” and if you’re Manson trying to clue a “THREE FOUR” anagram, this is both a plausible anagram to come up with and a plausible way to depict it. So we’ve got digit-spelling anagrams for every door except the right one. This fits with the idea that “odd one in” is meant to be a general Path principle. I’m assuming “ONE FIVE” is doing double duty for 15 and 5, but there might be some other means of hiding “FIVE” elsewhere, I guess. This is pretty exciting. Room 30′s never felt like it had a good solution behind it before. Great work, Owen! I reacted with a lot of excitement in response to the original post, and I’ll do it again here. This is the kind of real, solvable puzzle that I hold out hope for. I’m blown away! This is right up there with the best known solutions in the book. It makes much of our best efforts seem paltry and reminds us what a real solution looks like. My only complaint: Owen, you’ve ALWAYS thought that’s what this puzzle meant? Why are we only hearing about this now?! I like your solution better than any of the other solutions posted for this room. Sensible and consistent with Manson’s style. Your solution bumps the one I just did a hint for down the totem pole. We need a title for someone who takes a room from 5 to 5+… “Cluemaster in Chief” maybe? I posted this once before years ago, but it ended up getting buried. Honestly, I’m a little confused about how these comment threads work. Okay I had an idea. Not a completed idea but maybe the start of something? IF NO EVE? Then it is just Adam. Adam sounds the same as “Add’em” as in add them up. The arrow pointing to 5 could mean that 5 is one of the numbers to add and the watch hands are pointing to 15 and F (6). 5+15+6 adds up to 26 which doesn’t mean anything. That’s where I am now. Ideas? The Adam/add ‘em suggestion was made by a couple during the first Visitors in the Maze video we made, with non-MAZE people going through MAZE for the first time. I believe they added the alphanumeric coding of EVE to the 10 apples to get to 42; this wouldn’t be noteworthy result-oriented problem-solving except that they did this without even knowing that was the result they were trying to get! They went the wrong way anyway. I thought this was Gentile solution, but Gentile credits it to the Visitors episode on his site, and I trust his memory on that. I meant to say “a couple people,” not just “a couple,” but who knows, maybe that episode becomes more interesting if you interpret it the the latter way. I am not surprised to find that I was not the first one to get to think add’em. Crazy that it was first timers! Maybe there is a good solution in here somewhere? Well, I think the most plausible addition solution involves alphanumerically encoding O, U, and F, and adding them together. This is one of a few places in MAZE where you see spot-on alphanumeric coding solutions that are nevertheless a little hard to feel confident about, just because there’s nothing suggesting this is what we’re supposed to do here and this kind of thing would have to happen by chance some amount of the time. I think that idea is out of this world! Like an “orbit rock”? Maybe there’s a Room 3 connection here! There is actually a pretty good 7 made by the support for the tree and the shaded part of the curve of the watch on the left side. Put this together with the times from the watch (and text) and F = 6 and you get 42. Which I already pointed out in June. Never mind! In Morse Code O is 3 dashes and U is 2 dots and one dash. 4 dashes and 2 dots. 42. Amazing observation but it could be a coincidence, perhaps there is a compelling reason to be looking for Morse code hidden in this room somewhere? The apples on the tree make an two arrows pointing to door 42. The word NO is related to three of the doors. The door to room 34 has the word no straddling it (the no is upside down). The door to room 5 has the word NO related to it because you can anagram NO and FIVE out of IF NO EVE. 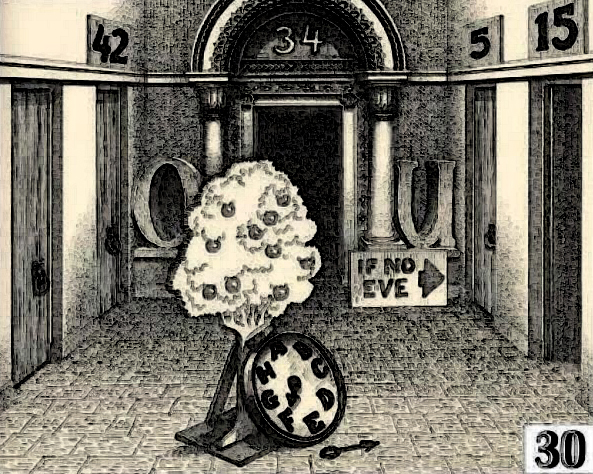 The door to room 15 has the word NO related to it because you can anagram ONE FIVE (15) out of IF NO EVE and you can take NO off of the sign as well. This isn’t necessarily anything new, but I wanted to point out that all three doors except for the correct one (42) have the word NO related to them. I’m not convinced that’s deliberate but it’s interesting. Brent also noted that 34, 15, and 5 are all associated with the word “no,” which we have all realized forever (“ou” upside-down is “no”) but never put together as an odd-one-in solution. Not to mention that “no” seems like a reasonable deterrent on its own, even without the odd-one-in principle. I’m nodding in agreement with that one. The combination of “no” with the theme of forbidden fruit seems pretty reasonable here too. This would be very satisfying if the watch could be worked into the theme as well. This might be completely off, but maybe the F refers to one of the doors that starts with F (forty two, five, fifteen), perhaps as an indication to not take thirty two, at very least. I know there are MANY complicated theories about the F clock, but there’s mine! The letters O and U are five letters apart in the alphabet. Sad..
You can make a decent letter “B” out of 7 of the apples — that’s the ‘”B” fruitful’ part. Then you multiply the 7 by the F = 6 on the watch. Here’s another one, in case you thought my apple-dappled “B” was not far-fetched enough. “Be fruitful and multiply” is apparently one of the Lord’s favourite sayings, and it appears also in Genesis 9, when he’s chatting with Noah and his sons after the flood, I think. It’s called the COVENANT OF THE RAINBOW and the rainbow is popularly considered to have SEVEN colours. We even have a rainbow shape over door 34; also 3+4 = 7; and there is a semi-respectable 7 in the top and left-hand doorframe of door 34. So you get fruitful and multiply the 7 cued in various ways by door 34 by the F = 6 on the watch and you get 42. It would be nice if you could get a good multiplication (X) sign out of the apples. You kind of can but it’s not very satisfying. You know, that rainbow shape over 34 even has 7 different strips on its front face — depends on what you choose to count, of course, but you can easily get 7. Just for fun… both “40″ and “2″ are important numbers in the Noah’s Ark story. It rains for 40 days and 40 nights; Noah collects all of the animals 2 by 2. The dial is at the F hour = verbal FOUR. Also verbal counting down as the minute hand has fallen “down” = 4, 3, 2 = Fourthreetwo = verbal = 4T2 = Room 42. Narrative: “What special significance can they have FOR us. Someone find a 7 in that tree to multiply by the F…or G.
conceived and bore a son. me, unless thou take also my son’s mandrakes? (Genesis 30: 34): And Laban said: I like well what thou demandest. of the first time, Jacob’s. Do u c a solution here? I just figured you posted this for some reason. What special significance can “O” and “U” have for us? I got this one, woke up at 5 am, and finally figured it out. Wow, you woke up and then read the 14-year-old posts on John Bailey’s site? Or did you read the solution on this very page? Good sleuthing, either way. Hidden Mystery, everyone here is either honestly doing their best to solve the book or is a real fan of the book like me. Empty boasts are worse than spam. And we have seen some of your sort of solutions and they are mostly idiotic. Please go away. So you mean like a calculator might have displayed in say the 1980s? No one to my knowledge has mentioned that. Looks good to me. 6 and a fraction apples fall inside the “7″ frame as well. I know I’m putting that together from various offered solutions, nothing about it is original, but has all been put together before? Episode 06 is online. Link to follow, most likely. 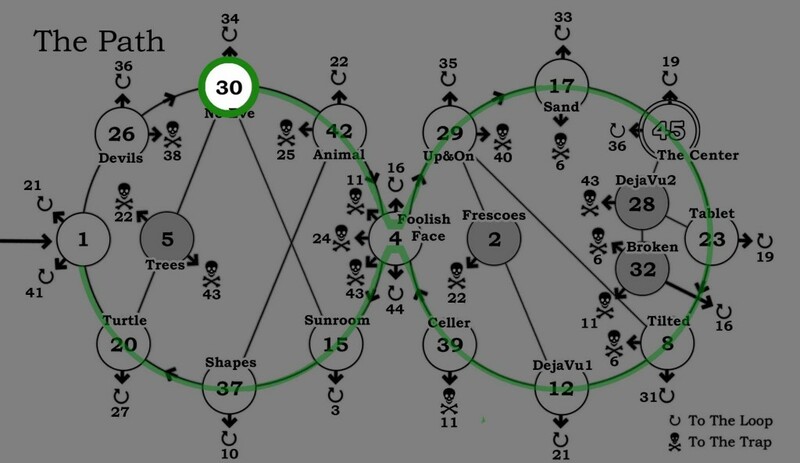 I thought the best takeaway here was Vince’s theory that the apple tree binds to room 34 (by partially covering it), “Eve” binds to room 5, and the fallen minute hand forms a male symbol suggesting “Adam” and points to room 15, leaving 42 as the only room not signified in this Garden of Eden narrative. Let me add that the number 42 has a well-known association with a certain book writtten by Douglas Adams, a STALWART ATHEIST. COINCIDENCE???? Really, though, I like that odd-one-in theory much more than the arrows+text combo, since the thematic cohesion of the Genesis story ties these elements together more neatly. Odd-one-in solutions where the “red herring” markers don’t go together in some recognizable way (as they do in room 1) just seem piecemeal to me. I’m still trying to tease out a 7 somewhere in here, though, for the purposes of the multiplication, so here goes: the fallen minute hand can spell 07, there are seven letters in “IF NO EVE”, drawing a line from the dial on the watch could separate seven of the apples from the lower left-hand three, and, what the hell, the tree starts with a singular trunk and splits off into six branches. None of those could possibly be winners, but I might as well toss ‘em in. Oh, I forgot to complete the thought that the “no” may play into the forbidden fruit thing going on. BIG DEAL. I think it’s meant to be a pretty strong warning against 34; note that all the other doors at least keep you on the path. Finally listened to podcast 6. Y’all convinced about the male/Adam, if no eve, apples over door reinforcement to the odd-one-in solution. Very well reasoned. The word “special” occurs only here and in 41. The ladder up from 41 to 35 is the “special” piece of furniture. There could be direction to get to 35 from 30 too, with some stretching. The yes (but no) bit could take us to 34. And then “Y” is alphanumeric 25 and that is the next door, then O+U=36 to which the closest door is 35. (stretch, as I said). Alternately, the door in front of us is the “I-door” and with all the “I” stuff in 41 the ladder could be an “I door” too in a way. Starting to think there might be a bit more to the ladder than a path to the roof.